The land is possibly better than Barnbougle Dunes and the views are to die for. 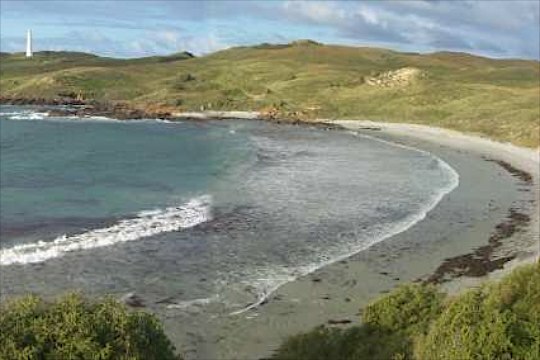 So renowned Australian golf course designer Graeme Grant is hoping to give King Island a world-class layout that may eventually become part of a “Golden Triangle” for golf in this country. Grant suggests golfers may come from far and wide to play in Melbourne, cross the Bass Strait to pay Barnbougle Dunes and Lost Farm and also head for King Island, as the final leg of the triangle. Either way work has begun on King Island on the $7m Ocean Dunes golf development. Grant said the beauty of the King Island site was indisputable and with so much land available there the opportunity to build something special there was evident. “Once people know about this place, you’ll be surprised how many people in my business take to it,” he said. “Barnbougle Dunes set the mould for remote-destination golf in this country. “We now know that people are prepared to travel because of what they’ve done there. “We’ve got what we think is a site that is the equal of what they’ve done there. Grant explained that his philosophy when it came to creating golf courses was simple: allow all classes of golfer to enjoy their round through the use of strategic design. “The contouring of the place is just ideal for golf. The land has the potential to be developed into the equal of anything in this country,” he said. Ocean Dunes is expected to open in November, 2014 and cater for 15,000 rounds a year when it becomes established, and well-known.